Forums of the Megaverse® • View topic - Palladium LOD 3 still no where in site!! Palladium LOD 3 still no where in site!! Post subject: Palladium LOD 3 still no where in site!! Palladium LOD 3 still no where in sight!! How long is this title going to be coming soon? First printing of Palladium LOD2 came out in 2002 so LOD3 has been coming soon for over a decade. I waited forever for coming soon book that was eventually taken off the coming soon list and has disappeared although. If you don't plan to publish LOD3 just take it off and say you cannot find anyone to write to your standards or you are too busy with all of your other projects to do it justice so you are not doing it. By the way your Palladium fantasy game is great I really enjoy the source books when they come out. The only problem is you don't publish them that often compared to the other games in your system. It seems that for every 3 of other systems we are lucky to get one. Oh by the way, I have gone to my local game store and asked for them to carry your product. I was informed that it is rather a pain to order them and that they do not barely if ever ship on time. Which leads me back into first statement: Will Palladium LOD3 ever be available after all this time? Post subject: Re: Palladium LOD 3 still no where in site!! Palladium LOD 3 still no where in sight!! "In sight" or "in site?" You say it one way in the title of the thread, and another way in your first sentence. Or are you making a deliberate pun, because it's not on the website? How long is this title going to be coming soon? 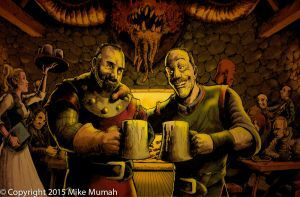 If you don't plan to publish LOD3 just take it off and say you cannot find anyone to write to your standards or you are too busy with all of your other projects to do it justice so you are not doing it. If you're addressing Palladium, you'd be better off sending them a letter by snail mail. Not sure how much the staff hangs out on the forums lately. Will Palladium LOD3 ever be available after all this time? I can't speak for Palladium, but no, it won't. I think the more pertinent question is: "Do we need it?" We have a few bits of information about what lives there and what's going on there... and frankly, it sounds like it's on a power level that's far beyond the capabilities of even the highest-level PC party to deal with. The Citadel is basically the Palladium version of Barad-dûr (http://lotr.wikia.com/wiki/Barad-d%C3%BBr). So, even if we had a book detailing it... what could you even do with it? We didnt need any of the land of the damned until the first books were printed. Now we need (want) the complete canon vision. My current campaign is actually in the land of the damned. It's needed more than a Rifts collection of monsters or a book on Antartica are needed. I think this is one of the reasons you only hear a few people screaming for this book. I have never GMd PFRPG and I have only played it a few times but I did read a lot of the books. Some of the best PB books ever written are from PF. Island at the Edge of the World and Library of Bletherad are outstanding books. Just wonderful reads but also great ideas for adventures and great places for adventure. LOD 1 & 2, not so much. When I read LOD 1 & 2 I was floored by how ridiculous the power level was. I was talking about it with a couple of my long time players, both who play more fantasy than I do, and we created a list of magical items and equipment they would need to just have a shot of surviving. It was massive and to acquire all of it would have been a campaign in and of itself. Another player said he would only take his character there if he had a Wilks pulse rifle from Rifts. I am really eager to read LOD 3 but there are many books I want more (both BTS sourcebooks, Hardware Unlimited, Mechanoids) before this one. That makes me want the third one to come out! I want to see it because it sounds like a great read. I have never actually played this game with any one other than my kids twice. I just enjoy the story lines especially in the fantasy settings. Also if you say you are going to publish a book than publish it. I have a lot of RPG games that I just enjoy reading. Barad Dur ... what could you even do with it? Considering the Land of the Damned is the battlefield of the chaos war, I think the Citadel is more like Angband and the Land of the Damned closer to Dor Daedeloth - if we want to draw a connection to middle earth at all. I would love to see and read LOD III. I am particularly interested in how it will be done and hope for more information on the Old Ones and their remaining cult as well as on Minotaurs. Also, since LOD 1 and 2 have been done, I want/need it completed. I'd love to see LotD3 come out to see how close my educated guesses were when I made my map of that region. I'd also like to fill in the local details on Broken Horn and The Bleakness.